The plan to visit the unclimbed horseshoe paid off. We managed to reach 2 of the 5 summits. One was 4700m and the second was 4800m. Both had great routes with down climbing, snow climbing and general good mixed climbing all day. The clients really enjoyed it. Last day tomorrow so we hope to have another day out if the weather holds for us. Home soon! 4th Aug: Dave has called to say weather has sadly stopped play. The team has seen a huge amount of snowfall in the last 48 hours which meant they could not make their summit bid and descend safely to base camp, so the tough decision was made to head down while the going was good. 16th August:Martin rang from the Alpine Tien Shan group – both groups are all having a lazy day by Lake Issykul, enjoying themselves and preparing for the trek out, back down to Bishkek and home. Thomas and Chris have opted for early flights home, Vicky and Aisling are having a few ‘Spa’ days in Bishkek, Robert is staying in the Karakol area trekking and Paul, Max, Jean and David are going to the Ala Archa area climbing for the next few days. 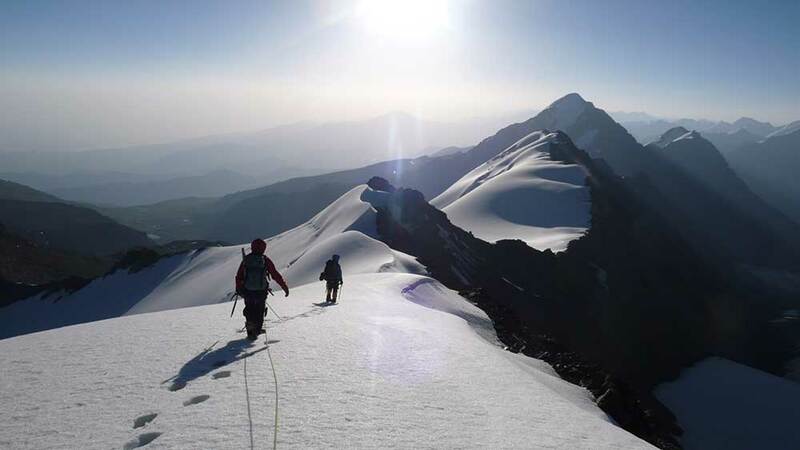 15th August: Whilst preparing for their summit push on Khan Tengri, the team received a weather forecast via Satellite phone that excessive snow was expected for the summit day, up to 30cm. With the difficulties and risks that this would bring, a group decision was made to descend from the mountain. Everyone arrived back in Bishkek yesterday, and some of the group have decided to go the Issy-Kul Lake to relax. Well done to everyone on a good effort on Khan Tengri, and for your achievements on other peaks earlier in the expedition. We wish you all a safe journey home. 9th Aug: Liam rang today with an update, now he can get satellite reception. Liam, Niels and Jesper reached the summit of Chapayev in beautiful sunny conditions with blue sky and spectacular views all round. Nick went a third of the way to the Summit from Camp 2 before turning back. Congratulations to the team! Once back in Camp 2, bad weather came in with blizzard conditions but the group got back safely to Camp 1 yesterday and are now at Base camp where the sun has come out again. Raj left the group after the training phase of the trip due to a strained leg as he decided it was not worth aggravating the injury or holding back the team. He has gone on to do some volunteering in the area. Andrew also decided to go back to enjoy the sights and sounds of Bishkek after the initial training period. Those at Base Camp are expecting the helicopter to arrive to collect them tomorrow morning and take them to Maidadir, before travelling overland to Karakol, then on to Bishkek. We wish them all a safe journey. 28th July: The group have just completed their acclimatisation and training period in the Ala Acha where they gained experience in ice axe, crampons, glacial travel and crevasse rescue before climbing Utchitel (Teacher) Peak at 4500m. Yesterday they practiced ascending and descending fixed ropes in readiness for Peak Chapeyev. The final hours were spent doing a bit of rock climbing for good measure. The group leave for Karakol in the morning and should fly by helicopter to the North Inglcheck Glacier on Monday. 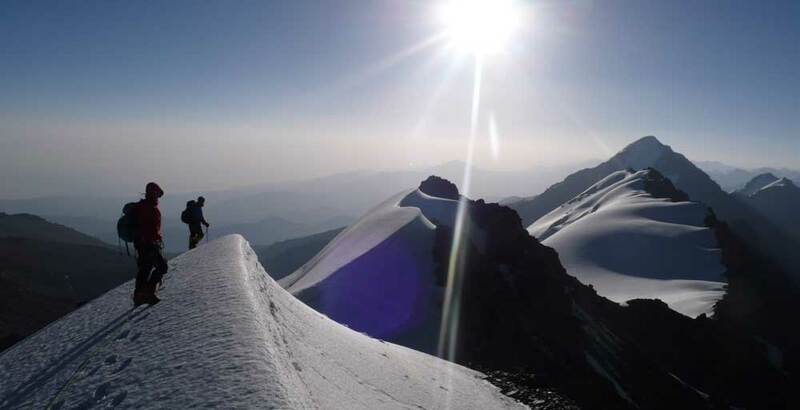 Tien Shan Peaks Expedition News July 24th 2010. 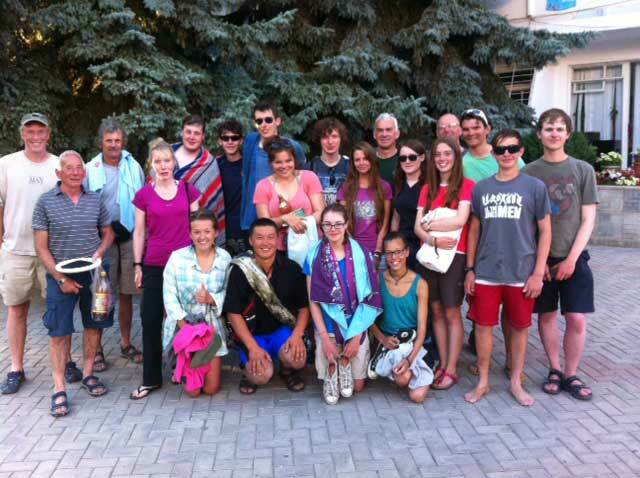 12th Aug – The team are now all back in Bishkek and will head to Almaty tomorrow to catch their return flight home. 17th Aug – The team are now all safely at Karakol after being flown back by helicopter from base camp.